You use a SWOT analysis to analyze or evaluate how an individual, business or company has performed over a specified period of time. Problems arise fro different random factors, some we don’t even know as problems or we do not really identify as something that poses as a problem. 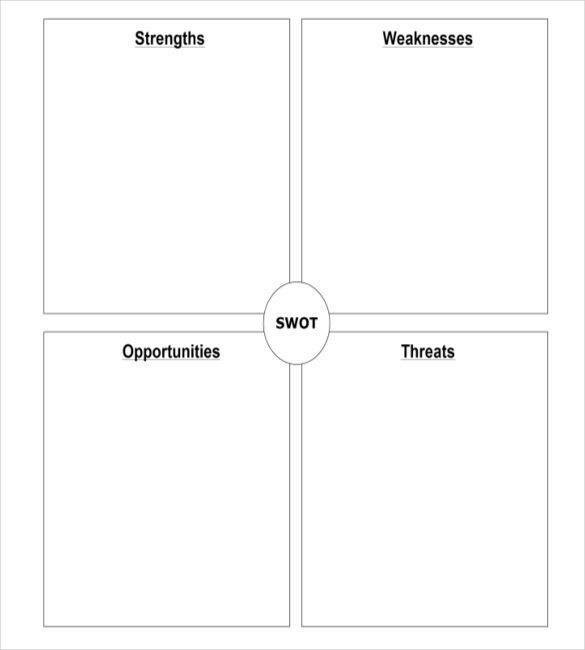 There are many known uses of a SWOT analysis, that even if it was mainly and more commonly used in businesses, it has made its way to being a useful tool in school, particularly in assessing the students. A student SWOT analysis, as they call it, is one of the many types of a SWOT analysis. 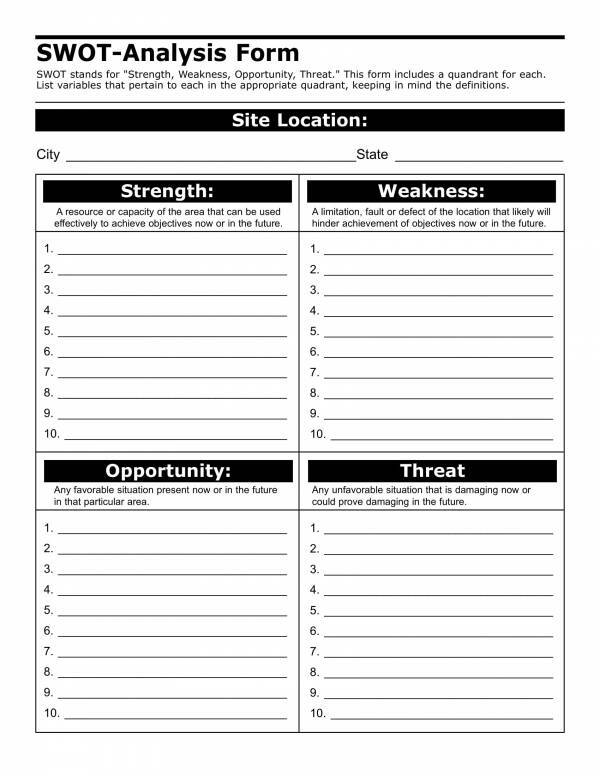 We have here student SWOT analysis samples and templates that you may refer to as we learn about it. What Is a Student SWOT Analysis? 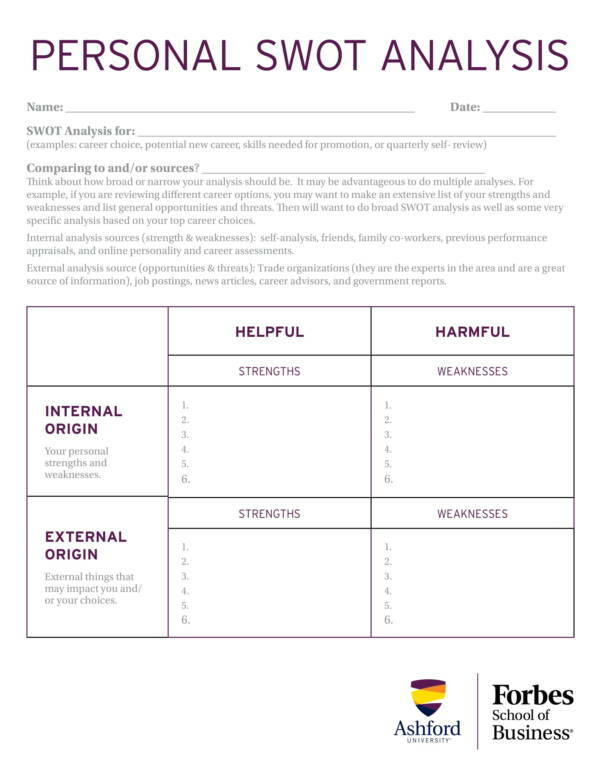 A SWOT analysis can be likened to that of a personal analysis that students can use to help them determine the best ways or strategies that will help them succeed in school or in finding a job that most fits their personality, skills, achievements and qualifications. 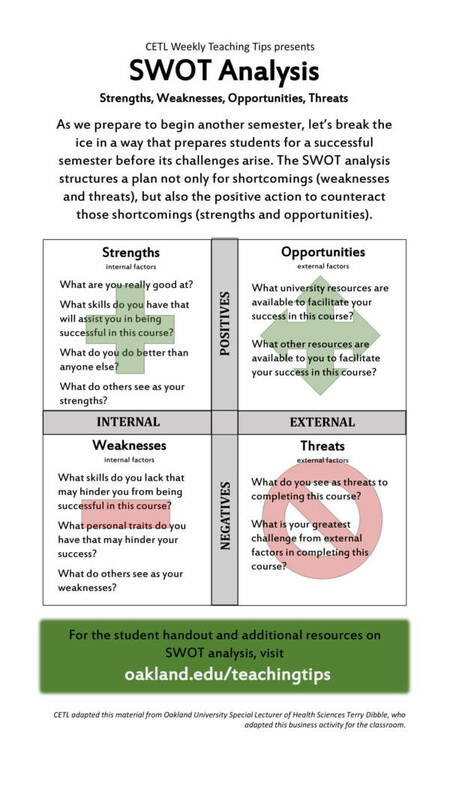 SWOT is an acronym that stands for strength, weakness, opportunities and threats. 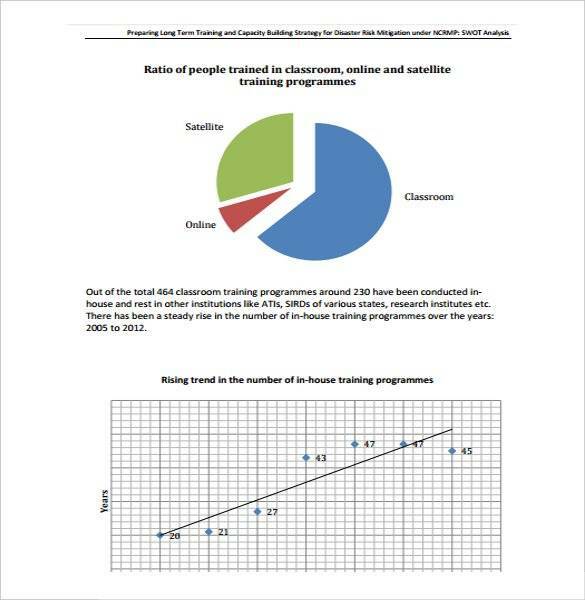 This tells us that a student SWOT analysis is conducted to determine the strengths and weakness of a student, as well as identify which opportunities are ahead of them and which things pose a threat to them. A SWOT analysis is created based on specific goals or objective that is either set by the student, their teacher, or both. A number of factors affect the data being gathered in a SWOT analysis, as well as the effectiveness of the analysis done. 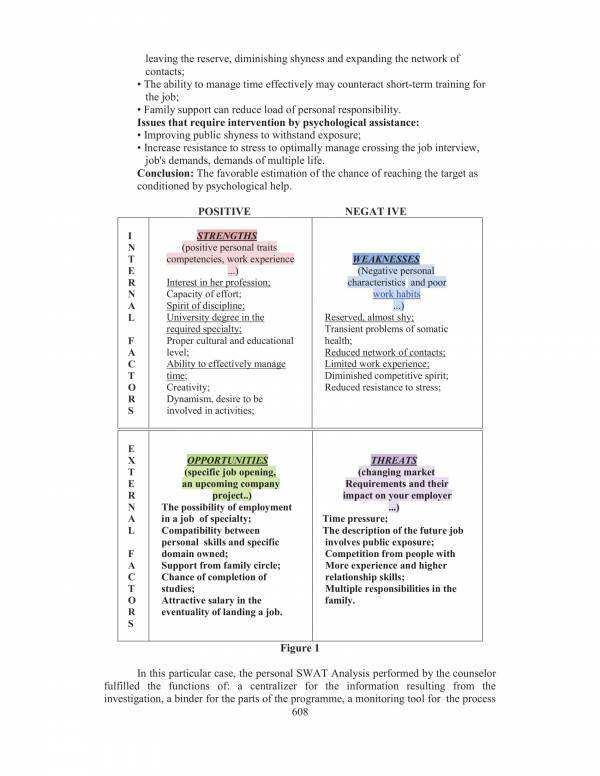 This is because you cannot create an effective job seeking strategy from an analysis that was created with the goal of establishing good study habits. A list of these factors are provided below. There are many ways on how a SWOT analysis can be conducted, and that is also one of the factors that affect the results of the analysis. 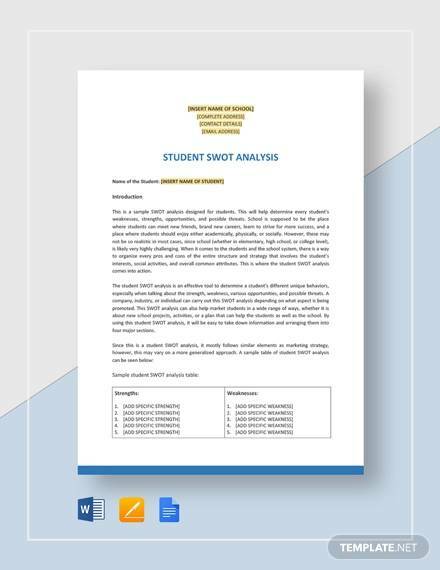 Other articles about SWOT analysis that you may want to check out are College SWOT Analysis Samples, Detailed SWOT Analysis Samples & Templates, and Manager SWOT Analysis Samples & Templates. There are as many uses of a SWOT analysis as there are many types of it being utilized both by individuals or organizations in different industries. Finding out the uses of a SWOT analysis in general as well as all its other types in existence will help you gain knowledge and understanding about this useful too. Setting specific goals – Before you start planning a SWOT analysis, you will need to set specific goals to help you determine and direct your analysis to the direction where it will most benefit you and your career as a student. Strategic planning – In a SWOT analysis, you will be gathering essential and related information that will help determine the personal or business strategies that will help you achieve your desired goals. Through the use if a SWOT analysis, you will be made aware of a lot of related factors that will allow you to create the best and most applicable strategic plan for your goals. Business planning – Planning for your business is also made easier and more effective with the use of a SWOT analysis. This is because you can determine the strengths and weaknesses of your business, and find out what your opportunities and threats are. Investment opportunities – You need to look into a lot of things before making any investments. Using a SWOT analysis is a great way to determine the best investment opportunities that are perfect for you and your preferences. Marketing – Great marketing ideas come from through research and analysis of one’s products and services. A SWOT analysis can help you identify the best opportunity for you to use such marketing strategy in a given time and place. Evaluating competitor – When you want to know about your competitors and how they are doing or faring in their business, then using a competitor SWOT analysis is the best tool for you. It will allow you to find out and learn more about how your competitor does business, which you can use to help your own business gain more profit and become better than them. Product development – Through the use of a SWOT analysis, you can find out what is missing or lacking in a certain product. This will help you determine which parts or features of it that needs improving or changing. Research reports – Since gathering essential information is one of the key steps in a SWOT analysis, it is no doubt a useful when it comes to creating a research report. A SWOT analysis offers one with a structured way of gathering data, thus making the research report more informative and reliable. What other types and uses of a SWOT analysis do you know of? There sure are more than what is listed above so if you want to learn about them, you can simply visit our website. Some of the interesting articles we have available are Business SWOT Analysis Samples & Templates and Marketing SWOT Analysis Samples & Templates. A SWOT analysis is conducted to identify the strengths, weakness, opportunities and threats to an individual or business. These are the four components being studied in a SWOT analysis. These four components are further divided into internal and external factors. Strengths and weaknesses are part of the internal factors, while opportunities and threats are part of the external factors. These factors are those that can be changed and controlled by individuals or businesses as it is something that they have in themselves that affects how they do things. 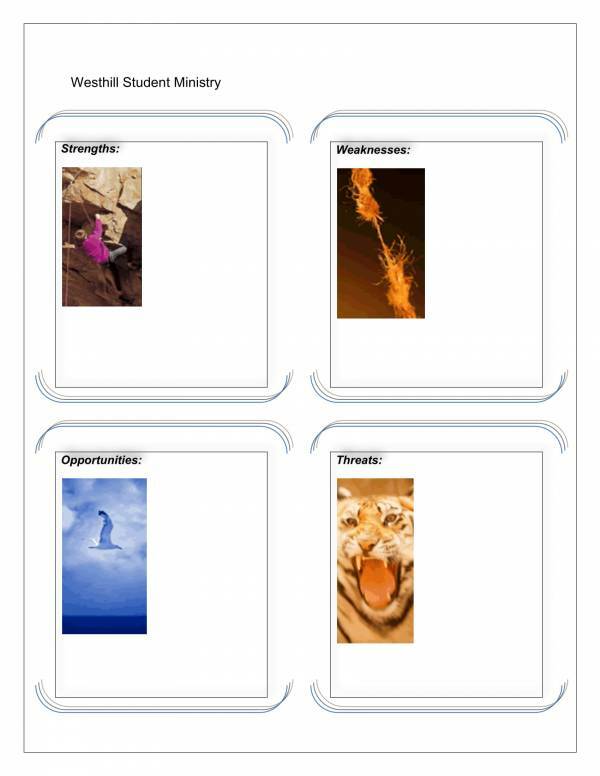 Strengths – This refers to the things that one is good at or where one is doing an excellent job. It could be any skill or talent that one is capable of doing, or something that they are capable of learning and understanding. Examples of strengths include, job experience in a certain field, able to communicate well using a different language, having a degree in particular course, etc. Weakness – It is the opposite of one’s strengths, which means they are the things that one is not capable of doing or things they do poorly. This includes lack of work experience, lack of self-confidence, not able to communicate clearly, short attention span, etc. External factors cannot be controlled as they are those things that happen around an individual or business that are caused by a natural occurrence or by another individual or business. Opportunities – May also be referred to as the number of chances that one can take advantage of in order to achieve their goals or part of their goals. Examples of opportunities are joining networking events, being an alumni of a certain university or school, new business openings, etc. Threats – Threats are seen as those things that may possibly hold one down or pull one down if not determined and addressed immediately. Threats include lack of self knowledge, not making any improvements at work or in school, failing to arrive on time for a job interview or business meeting, etc. Before you even start with your SWOT analysis, make sure that you know well each of its components and that you have prepared the needed questions to guide you through the entire process. 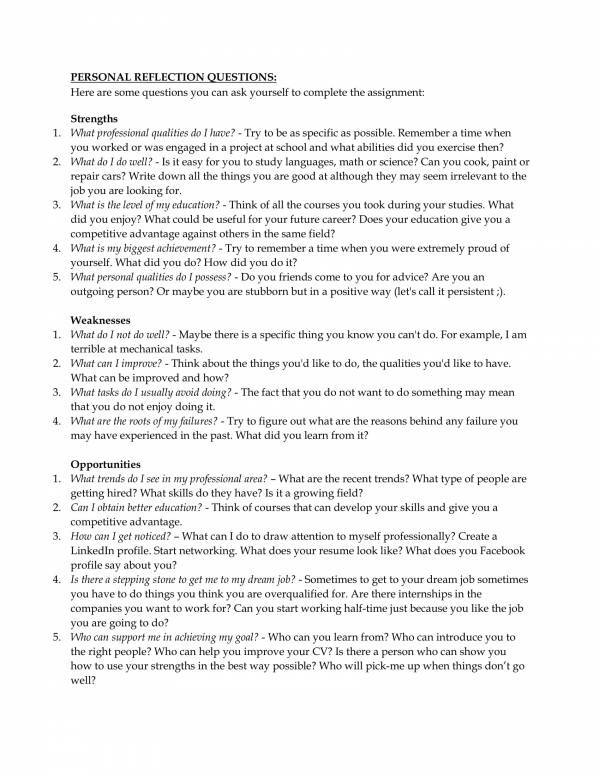 You may gather useful SWOT analysis samples and templates, like …. on our website. 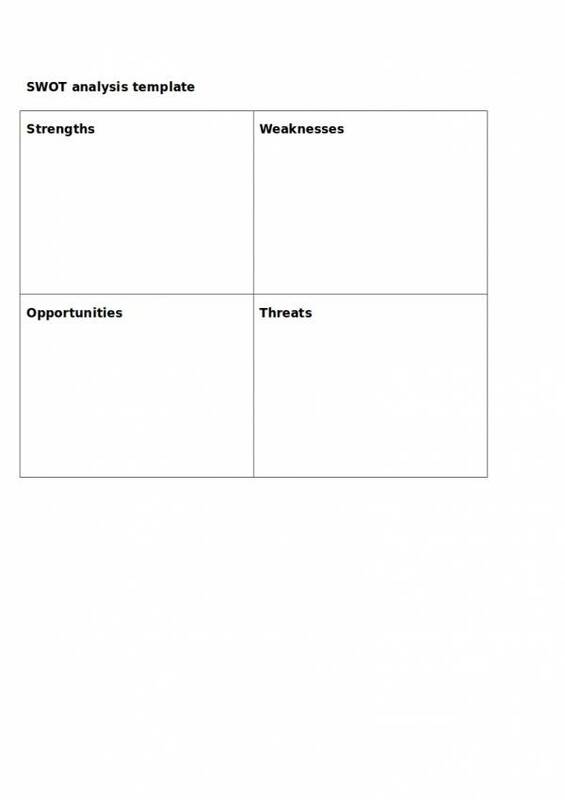 What can you get from a SWOT analysis and why should you use a SWOT analysis template? A SWOT analysis has a number of advantages that are truly beneficial to its user. A list of these advantages are as follows. Conducting a personal SWOT analysis or a SWOT analysis for your business allows you to identify key issues or problems that directly and indirectly affect your business. There is little to no cost when it comes to conducting a SWOT analysis. This is because you really do not need an expert to have it done. Anyone who understands your business and who has in-depth knowledge about it can perform a SWOT analysis. Performing a SWOT analysis also does not require a lot of time, especially if the issues being addressed and not really that complex. Because a SWOT analysis is based on your goals and objectives, you can focus or concentrate more on the important factors that affect your business. Through a SWOT analysis, you can understand your business better, determine and address weaknesses, take advantage of the opportunities that are available to you, and deter or prevent any threats. 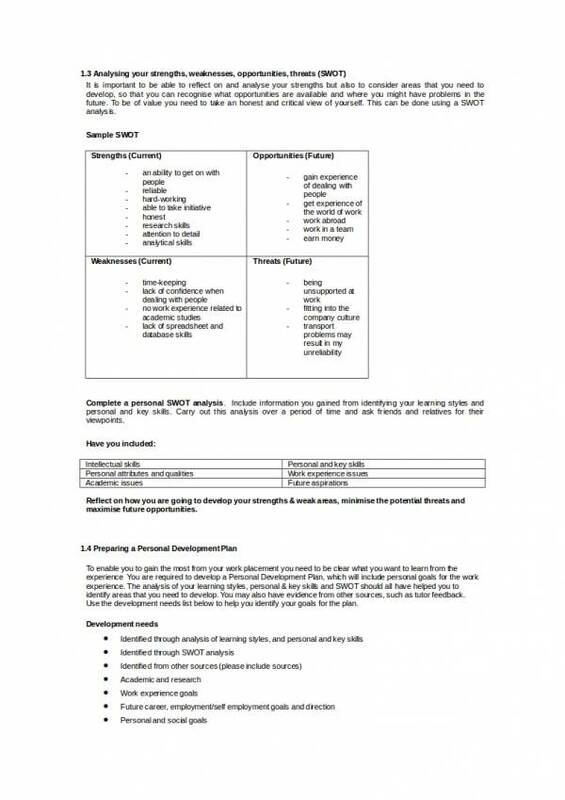 There are a lot of SWOT analysis templates that are available online for free, which makes it convenient for anyone to conduct and document the SWOT analysis they are performing. The templates are also very simple and easy to use. 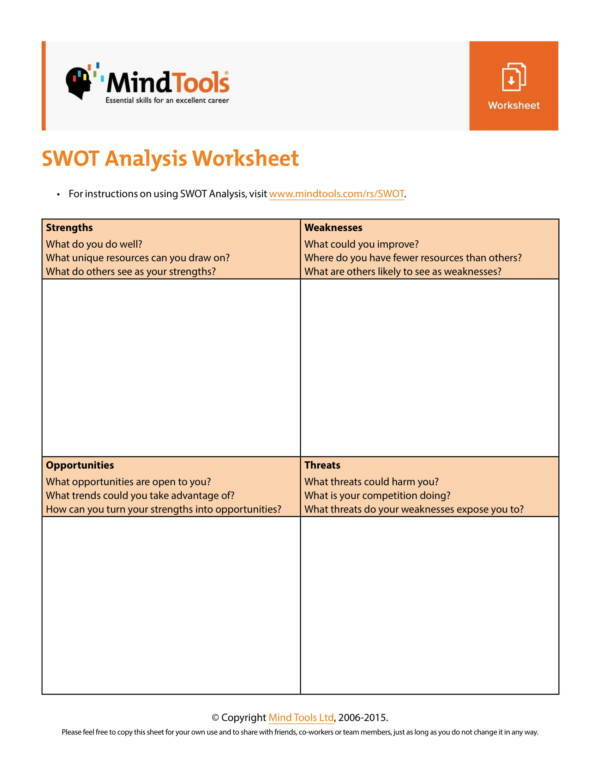 Learning about the advantages and benefits that you can get by performing a SWOT analysis and using ready made templates will help you decide it the tool works for you or not. Other related articles you may be interested in are HR SWOT Analysis Samples & Templates and Hotel SWOT Analysis Samples & Templates. 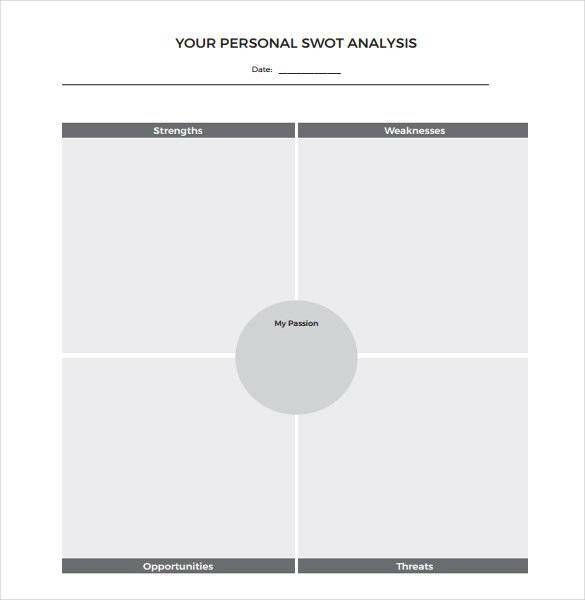 Here, we will provide you with simple and easy-to-follow steps that you can use as guide or reference to help you make your own all purpose SWOT analysis template. You will first need to create a draft of the SWOT analysis template that you are going to make. You may use samples and templates that are available online as your reference. Next, determine the things that you want to include on your template, aside from the SWOT components. They are standard so they should not be taken out of the picture. Make a list or an outline of the additional things you want to include. Then decide how you want to make your template. You can make one using a computer or you can make one manually. Once you have decided on this, you will need to prepare for all the materials and equipment that you will need to use to get started. When you have everything ready, you can start doing the actual template. Get your draft and outline, and transfer its contents one by one to your final sheet. After all of the contents are transferred on your final sheet, review your work and check if there is anything that you missed or have not included. Make revisions as you see fit. If you are satisfied with your work, then you can make it final by saving the document or using a marker to thicken lines and making titles bold. You may also find other articles we have useful, like Retail SWOT Analysis Samples &Templates and Hospital SWOT Analysis Samples & Templates. The key to becoming successful at conducting a SWOT analysis and being able to write a good report is to know the things that you must do to be able to do it properly. Here are some useful tips that will definitely help you improve how you do and write a SWOT analysis. When selecting the person or group of people to conduct a SWOT analysis, choose someone who knows the business-well and has in depth knowledge of it, instead of assigning it someone who is in some position within your organization. Emphasize the goals and objectives for performing your SWOT analysis and make sure that everyone knows about it, not just the assigned people. Make everyone in your organization or group involve in it. Request their opinion about the issues you are trying to address. Some may be useful and some may be unrelated, but you will be amazed at their opinions, which may find useful and appropriate on certain situations or occasions. Always keep your report short and simple. Gather as much data as you can, but make sure to filter it out and only include important and related information. Arrange your data according to priority. Important data should be on top and least important ones should be at the bottom of the list. Use simple clear and simple terms. Avoid technical terms as much as you can. If not, provide a page dedicated for the definition of terms for technical words or jargon. Make it a habit to spell check and proofread your work. This way your output will come out understandable and professional. Follow the tips above and you will surely be able to get things done accordingly. We hope that you are able to learn from this article. If you would like to see more about SWOT analysis and other analysis related articles in general, please feel free to check them out on our website. Some of the titles we offer are Restaurant SWOT Analysis Samples & Templates, Professional SWOT Analysis Templates, and Financial Analysis Samples.